©2007-2009 NCL Magazine : Bev Lacey, Mae Collins, Sarah Leake, and Kay Pfaltz, in a photo two years ago at their 10 year celebration. Hard to believe it’s already been 12 years. Yep, over a decade that Basic Necessities, that quaint wine, cheese, coffee, restaurant in Nellysford right next to Wintergreen Hardware has been in business. We often refer to it as the Student Union! 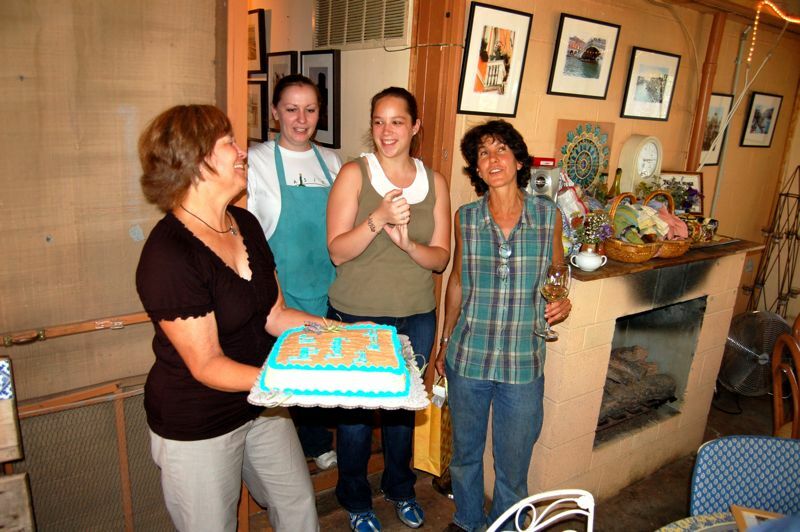 Way back in 1997 Kay Pfaltz and Judy Nelson started the tremendously popular restaurant. Two years ago we covered their 10th anniversary celebration. Today Kay is still there along with Bev Lacey and Keith Dix who bought the place a few years back. Anyone that knows me and Yvette – know we love that place, and it’s one of our favorites! And now Adam’s! If you see any of the gang this month at Basic, be sure to wish them a Happy Birthday! Basic Necessities Goes Solar….Sort Of, & Good Luck FP!